Seeing as its Friday, and I haven't done a Coffee/Tea/Chocolate in the Movies for a while, I decided to look at two movies that feature chocolate. I was sorely tempted to include Chocolat again, just because it's SO sumptuous, but I restrained myself. The first on today's list is Practical Magic . 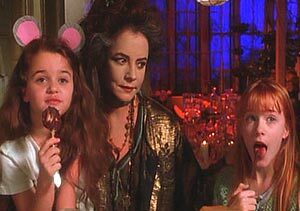 Chocolate in this movie represents a flaunting of tradition and "normalcy". The storyline focuses on a family of witches and their problems with men and magic. Sally and Gillian Owens (played by Sandra Bullock and Nicole Kidman) each have their own issues with being part of a family that is both cursed and blessed. Not surprisingly, the townspeople don't accept the Owens women. The eccentric aunts say the townspeople are jealous of their gifts, and that being just like everybody else "denotes a lack of courage". They encourage living outside the lines. Chocolate for breakfast, lunch and dinner is entirely acceptable. Important after-dinner lessons are spells, not school homework. Sally and Gillian react to the lack of acceptance in their own ways. Gillian leaves home and lives a wild life. Sally stays and suffers. She doesn't want to be different. She just wants to be normal, to live a normal life and be accepted. She tries to keep her children from their magical heritage, but when her husband dies and they all go to live with the aunts, that "normal" life is tossed on its ear. Nature will out, they say. Eventually Sally finds love and acceptance with the townspeople in the final scene where all the women come together to defeat the bad guy -- "There's a little witch in all of us". Movie number two - Forrest Gump - may be be a pretty obvious choice. Chocolate plays an integral part in the plot, although we don't actually get to see much of it. 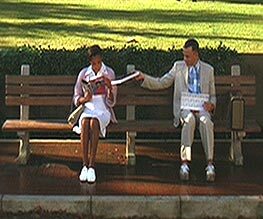 At the opening of the movie, we see Forrest sitting on a bench at a bus stop, with a box of chocolates on his lap that he's planning to take to Jenny, the great love of his life. A stranger joins him on the bench, and he offers her a chocolate. 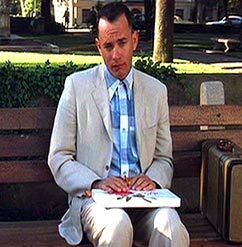 Then he reminisces, "Momma always said life was like a box of chocolates. You never know what you're gonna get." And then Forrest begins to pull out memory after memory, sharing them with the strangers on the bench, offerings from the chocolate-box of his own life. Why, this entire movie is a box of chocolates. You just never know what's coming around the corner. His adventures come at you, one surprise after another. 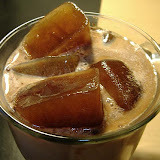 A nougat; a caramel; dark or light chocolate, plain or creme-filled. By the time we get to the end of his journey with him, when he arrives at Jenny's and offers her the box of chocolates, we see that he's offering her no less than his entire life. And it's not the end of the journey at all. Life throws him another curve. But he meets it with a full heart, and a willingness to sample whatever flavors the box still has to offer, as he has done his whole life.